If you are looking to buy one of these brands: Anolon, Circulon or Calphalon, you might be a little confused about the difference. I certainly was. They all offer top notch cookware at prices most of us can afford, and their features are so similar in many ways, it’s hard to know which one to get. So, in this detailed breakdown review I want to show you clearly the differences, the shared features and which you should buy when. Although the cookware from all these brands is very similar, we are here to look at the differences. So, let’s start with the basic materials they use for the pots and pans. Anolon’s name is actually derived from hard-anodised Aluminum so it is no surprise that this is the basis of most of their pans. This is basically Aluminum that has been treated to ensure that the surface of the metal is non-reactive. Anolon has also introduced copper to some of their more modern cookware – the Nouvelle Collection, which helps the pans heat faster and more evenly. So, you will usually find this feature in their more expensive models. Circulon is another Meyer Group brand like Anolon, and they also use anodised Aluminum on most of their pans. It has become almost a staple amongst many cookware makers, and for so many reasons – durability, cost, heat distribution. These guys also have steel-based cookware in their arsenal, which can help with heat distribution, especially for induction cooktop owners. Calphalon is actually not owned by Meyer, so that’s a nice change! They also mostly use anodised Aluminum on all their pans, especially the more consumer end models. Like all the other brands in this review, they also have good old stainless steel pans, which chefs usually prefer. And you will find their triply models mostly in this range, which feature a sandwiched layer of copper and steel. Their Aluminum models also have this included, but they are not super common or easy to find (at least from what I can see). Of course, they all love their non-stick coatings, but there are some differences worth noting. Circulon has made a name for themselves with the ring of circles they use on the surface of their pans. The circles are there to help protect the surface of the pan by reducing the actual area that is exposed to potential scratches from cooking utensils. Circulon claims this makes them three times more abrasion-proof, which means they will last a lot longer. Non-stick coatings are used by all three of these manufacturers. Anolon uses a variety of DuPont PTFE (brand name Teflon) coatings for their pots. You can find more information about their coatings here. Circulon uses their own Total Nonstick which is also a PTFE-based nonstick, that is also PFOA-free. Calphalon also does the same with a PTFE-based (and PFOA-free) non-stick on their pans. Of course, if it is 100% stainless steel, then you won’t see any coating on the pan, no matter which manufacturer. This one seems pretty straight forward because they all mainly use stainless steel handles. Anolon actually made a name for themselves back in the day with their SureGrip® silcon handles, which are a great addition to any pot or pan. They help you keep a nice grip on your cookware, and it also does not get hot so easily. The only downside is that this limits the maximum temperatures at which you can heat the pans. So, for example, if you want to put it in the oven at high temperatures (up to 500F), there is a chance the handle will melt or burn. That is why chefs usually only tolerate stainless steel handles. There is never a temperature limit on those! 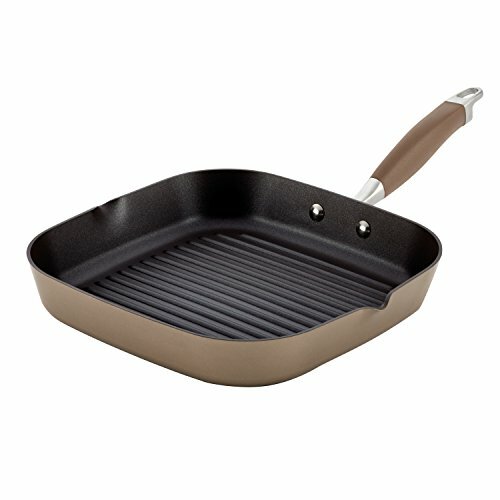 Generally, Anolon pans with suregrip are ok up to 400F, while their other pans can handle 500F. Circulon has more of a mix of handles, both stainless steel and silicon covered ones. Just always keep in mind that although silicon is often easier to grip and use near heat, it is limited to 400F. So, don’t get one of these if you plan on using in a hot oven or broiler. Calphalon uses stainless steel handles in almost all their pots and pans. I have seen some sauce pans with silicon handles, but those are usually not placed in the oven. For the rest, they seem to stick with stainless steel – so they are oven and broiler safe. This is a big thing for a lot of us, but there are always compromises when it comes to putting your pans in the dishwasher. First, they often do not come out clean, because of all the baked on goodness left behind after cooking. But on top of that is the question of whether it is good for the non-stick surface. If you are buying all-stainless steel pans, then skip this part because it is a definite- yes. For the rest, the answer is – it depends. You have to check the specific model you are buying. Most will say yes, but keep in mind it is usually not great for the longevity of a non-stick surface. You are far better off washing them by hand with a non-abrasive sponge. If you use one that has an abrasive part, you risk scratching or damaging the surface and ruining the nonstick. I have done it myself in the past and had to buy a new pan not too many months later! Anolon has more premium features in some ways, like with the supergrip handle and DuPont top-notch non-stick surfaces. So, I would often look at their products first. Circulon, on the other hand, has an interesting solution to keeping your nonstick scratch free with their undulating circle technology. For the rest, it comes down to the price and range of pans in each set, or the specific sizes you need for your cooking. Because in the end they have very full offerings and lots of choice. Take a look for yourself with the buttons below – which lead to their ranges on Amazon.